Chlorophyl and Eosin Orthochromatic Plates.— In a communication to the Franklin Institute, which we take from the Brit. Jour. of Photography, Mr. Fred. E. Ives, of Philadelphia, Pa., relates some interesting experiments recently made on the combination of chlorophyl and eosin, as follows: The subject of color sensitive photographic processes has received a great deal of attention during the past year or two, but there has been, and is still, a great diversity of opinion in regard to the capabilities of the various color sensitizers. In illustration of this fact I will mention that Becquerel; who first tried chlorophyl, stated that with it he made plates from one-fifth to one-tenth as sensitive to the red of the spectrum as to the blue or violet. Dr. Vogel estimated that eosin-stained plates were eight times more sensitive to the yellow-green of the spectrum than to the blue. I myself stated that plates stained with myrtle-chlorophyl, according to my published method, required even less exposure through a yellow glass than eosin plates. Captain Abney stated that, according to his experience, stained plates were always many times more sensitive to blue and violet than to any other color; and many persons have believed that the color sensitizers acted more by reducing the blue and violet sensiti veness than by actually increasing the sensitiveness to other colors. For the purpose of proving the capabilities of chlorophyl and eosin, I have made four photographs of the lime light spectrum, one on a plain emulsion plate, one on a chlorophyl-stained plate, one on an eosin-stained plate, and one on a plate stained with both chlorophyl and eosin. The spectrum was projected by means of an optical lantern and a flint glass prism, with a slit measuring one-fiftieth of an inch. It will be understood that the different colors have not exactly the same relative intensity in this spectrum that they have in the solar spectrum, but the difference is insignificant. Short wires were placed so as to cast shadows on the sensitive plate, to aid in the comparison of results. Some of these wires, which I have marked, occupy the position of Fraunhofer lines in the solar spectrum. All plates were prepared with the same collodio-bromide emulsion, and received the same exposure and development. The plain emulsion plate shows very little action, except in the blue, violet, and ultra-violet; the maximum of sensitiveness is in the middle of the violet. (It should be noted here that with gelatino-bromide dry plates the maximum <jf sensitiveness is in the indigo blue, about G, and they are also relatively more sensitive to green and yellow.) The chlorophyl plate shows a very strong action all through the visible spectrum—strongest in the red, orange, and dark green; weaker in the blue and violet; and weakest in the yellow-green. In the red, below C, the plate shows about five times as much sensitiveness as in any part of the violet; in the orange red, twice as much; in the yellow-green, one-half as much ; and in the dark green, one and a half times as much. The violet sensitiveness appears to be slightly reduced near H. This experiment proves that my chlorophyl plates are remarkably sensitive to all colors, as I have many times asserted that they were, and that they are twenty-five to fifty times more color sensitive than those which Becquerel employed in his experiments. They are probably 400 or 500 times more sensitive to red than unstained plates. The eosin plate shows no action in the red and orange, very little in the yellow, a great deal in the yellow-green, and considerable in the dark green. The action of eosin is strongest exactly where the action of chlorophyl is weakest; it gives about the same degree of sensitiveness to yellow-green that cnToropnyi gives&apos; to red, but in a broader band. The violetsensitiveriess appears to be exactly the same as in an unstained plate. The chlorophyl-eosin plate shows by far the most remarkable result of all. Neither sensitizer appears to have retarded the action of the other, but rather to have aided it, so that the weakest portion of this photograph below F is stronger than the strongest portion in the blue and violet! Nearly a year ago I recommended that chlorophyl and eosin be used together in practical isochromatic photography, and this experiment proves that the combination possesses the advantages which I claimed for it. I have found that, in order to secure the best results with the chlorophyl-eosin process, fresh, strong, blue-myrtle chlorophyl solution must be used, and the amount of eosin must be strictly limited, otherwise, the plate will not be so sensitive to yellow and to blue-green. I now prefer to apply the eosin by simply tinting it with water in which the plate is to be washed,after applying a. plain solution of chlorophyl. 1 have an over-exposed negative of a bright chrome card, which I made on one of these chlorophyl-eosin plates, with an exposure of one minute in the light of a coal oil lamp having a single small Argand burner and nickel reflector. No color screen was used, but, owing to the yellowness of the coal oil flame, all the colors have photographed correctly. An unstained plate, with same exposure and development, showed only the high lights of the picture very faintly. The Law as to Party Walls. A party wall in law is the wall dividing lands of different proprietors, used in common for the support of structures on both sides. At common law an owner who erects a wall for his own buildings which is capable of being used by an adjoining proprietor, cannot compel such proprietor, when he shall build next to it, to pay for any portion of the cost of such wall. On the other hand, the adjoining proprietor has no right to make any use of such wall without consent of the owner, and the consequence may be the erection of two walls side by side, when one would answer all purposes. This convenience is often secured by an agreement to erect a wall for common use, one-half on each other&apos;s land, the parties to divide the expense ; if only one is to build at the time, he gets a return from the other party of half what it costs him. Under such an agreement, each has an easement in the land of the other while the wall stands, and this accompanies the title in sales and descent. But if the wall is destroyed by decay or accident, the easement is gone, unless by a deed such contingency is provided for. Repairs to party walls are to be borne equally; but if one has occasion to strengthen or improve them for a more extensive building than was at first contemplated, he cannot compel the other to divide the expense with him. In some States there are statutes regulating the rights in party walls, and one may undoubtedly acquire rights by prescription on a wall built by another, which he has long been allowed to use for the support of his own structure.—Building. Mineral Ultramarine. J. R. Jackson, F.R.S.—The preparation of ultramarine is as follows : The pieces of lazulite the most rich in color are picked out, they are washed, and then plunged into vinegar, and if the color does not change, the quality is esteemed good. The stones are then again repeatedly heated, and plunged each time into vinegar. By this means they are easily reduced to an impalpable powder. This is then well worked up into a paste with resin, white wax, and linseed oil, to which some add Burgundy pitch. The paste is then put into a linen bag and kneaded under water, which at first assumes a grayish color, resulting from the impurities that are first separated from the mass. This water is thrown away and replaced by fresh,&apos; and the kneading recommenced, when the water becomes of a fine blue. This is poured off and allowed to settle, the precipitate being ultramarine of the finest quality. The repetition of the process furnishes color of inferior quality in succession, and finally the residuum, being melted with oil and kneaded in water containing a little soda or potash, yields what is termed ultramarine ashes. The inalterability of ultramarine is a most valuable quality; but this very property is injurious to the effect of old paintings, for while the other colors have changed, this, preserving its original brilliancy, all harmony is destroyed, as may be observed in many old paintings and frescoes. Convention of Civil Engineers. The Annual Convention of the American Society of Civil Engineers will be held at Denver, Colorado, on July 2, 3, and 5. Sessions for professional discussion, and one for the transaction of business, will occupy the three days. At the close of the Convention, several railway excursions will be made to a number of points of engineering interest in Colorado. These excursions have not yet been fully arranged, but Will probably~tireluae Grreeley a"nd tfie extensive irrigation works in its vicinity, Georgetown, Lead-ville, Gunnison, and Pueblo. It is proposed that they shall terminate at Colorado Springs, where the engineers will separate for their respective homes. A large attendance is anticipated, and in consequence very favorable transportation rates have been secured. Mr. Henry Flad, the President of the Society, will deliver the annual address during one of the sessions of the Convention. David Van Nostrand, a well known New York publisher and importer of scientific books, died June 14, in the 75th year of his age. He was first employed in a city bookstore whenv15 years old, and subsequently became acquainted with many military and scientific men, who gave him orders for books, relying upon his good judgment for their selection. 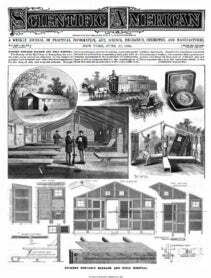 He thus, as well as from the natural bent of his tastes, developed a business especially in the line of military and scientific books, his military publications during the war of 1860-65 having been numerous. Generating Steam by Slag. Mr. Brotherton, Superintendent of the American Smelter, at Leadville, Col., has patented a plan for generating steam for motive power at the smelters through the use of slag. By this method the slag is dumped into large shallow vessels, which are afterward run under boilers, and the heat used in generating steam. An experimental test of the method resulted in maintaining 75 pounds pressure on a vertical boiler for seven days. if the plan proves practical, it will result in a saving to the smelter of &dollar;1,200 to &dollar;1,500 a month.